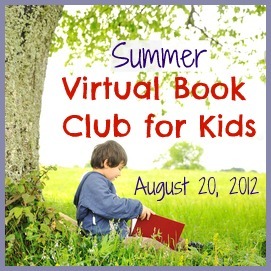 If you missed our July Virtual Book Club, come join us for August! This summer we are hosting a Summer Virtual Book Club with 20+ bloggers Typically we host a Virtual Book Club each month and feature just one book. This summer we will be studying several different authors and we will be showcasing loads of new books! In August we are studying Kevin Henkes! Pick your favorite book by Kevin Henkes (or a new one you want to check out) and read it with your child or class. Come back and share it with us as part of a big Kevin Henkes blog hop on Monday, August 20th! The linky will be live for 3 weeks, so if you aren't ready to post on the 20th... just join in when you can! I can't wait to see what you create!! Each month the posts get better and better! We've been having so much fun with our book club that we plan to continue it all year long! Make sure to stop by the Virtual Book Club Facebook page for updates. We will be announcing the Fall line up of authors pretty soon! Have you entered our awesome BabbaBox giveaway yet? BabbaCo is GIVING AWAY a 3-month BabbaBox membership to one of our Toddler Approved readers! Go here to check out the details. Only 2 days left to enter... so don't miss out! Go now! I discovered Kevin Henkes thanks to a midwife when I was told her the name we picked for our son was Owen. I bought "Owen" before he was born, and I was beyond happy to find "Owen's Easter Chick" for his first easter basket! As a kindergarten teacher, Kevin Henkes' books make appearances throughout the school year. My back to school favourite is Wemberly Worried. Hi - we had a regular supply of Kevin Henkes books from the local library when we lived in St Louis MO, the only one we have on our bookshelf now that we live in Scotland is 'Birds' with lovely illustrations by Laura Dronzek - but it would be great for a crafty inspiration, so we will join your link up! I would love to join in... I thought I could link up but can't seem to see where to link up to. So here's a look into how we enjoyed our Kevin Henkes books.